The tool manufacturer Vandurit has developed an innovative rollFEED turning method that is matched with an exclusive hyperMILL CAM strategy from OPEN MIND. 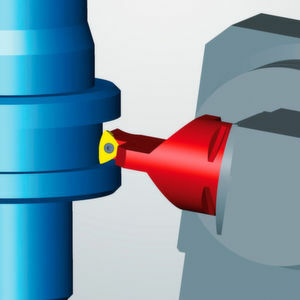 Thanks to this collaboration, there is now a new solution for CNC turning that offers maximum process reliability and significantly reduces machining times and tool wear. OPEN MIND has developed an efficient rollFEED turning strategy in hyperMILL to suit all your turning needs. Flawless workpiece contours can now be achieved in no time at all. As a 3-axis machining strategy, rollFEED turning makes it possible for the entire contour of the tool’s cutting edge to roll off rotationally symmetric surfaces of any shape. The cutting movement is produced by a horizontal swivelling of the B-axis with simultaneous compensation for the X and Z-axes. This means that grooves can be machined with a single tool in a single movement. The CAM strategy automatically guides the tool from the first to the second plane surface via the cylinder face. Thanks to the combination of roll and turn movements; even workpieces with large radii can be machined with collision checking. This makes for full process reliability. The hyperMILL rollFEED turning strategy is perfectly matched to Vandurit’s three rollFEED components, cutting inserts, tool system and drive unit. The drive unit compatibility also makes it possible for Vandurit to refit lathes that do not feature a pivoting axis. The tool solutions from Vanduritare designed to meet the highest demands in the automotive and aerospace industries, in the steel and roller industry and in medical technology, as well as in machine engineering and mould making. Our customers machine their rotationally symmetric workpieces up to 90 percent faster than the competition, and at the same time reduce their tool diversity and tool wear by up to 90 per cent. As a flexible manufacturer and provider of precision turning and milling tools, we have developed our rollFEED turning method in several stages to establish it as a benchmark technology.